We held our annual Summer Tea Party on Thursday afternoon 19th July in the Church Hall. After welcoming our guests from local churches and MU Branches there was a short table quiz on traditional sayings followed by a buffet tea and hot drinks. There were also 2 games - a Treasure Hunt Board and “Guess the number of sweets in the jar” plus a table of MU Merchandise including cards and calendars. With donations plus the contents of our Overseas Boxes the total raised was £128.56 for the “Summer of Hope Appeal”. At our September meeting we were able to see some of our finished projects. Two blankets beautifully knitted by Audrey Mentor and friends at her care home. Another two blankets were knitted by several of our members, who knitted long strips which were sewn together by Sue Andrews and edged in crochet. Eight warm beanie hats together with several pairs of gloves. All of these items will be delivered to the Two Saints charity in Fareham. The blankets are given to their clients once they can be rehoused. They will normally be given second hand sofas or chairs to furnish their new homes so a nice colourful throw is greatly appreciated. 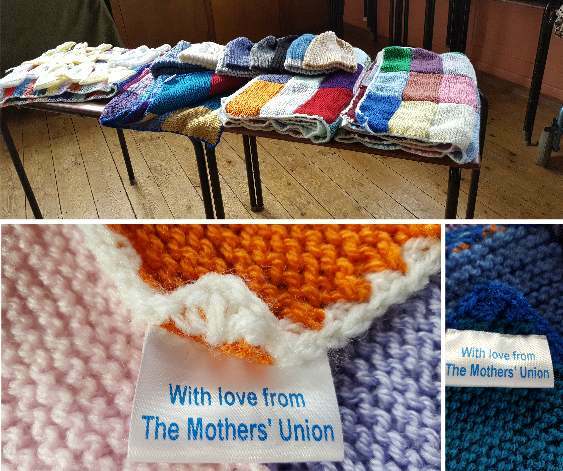 Also Sue Andrews had knitted six more sets of the baby gowns used by the maternity unit at QA Hospital. They are used for the precious still born babies. Each set comprises of two identical ‘Angel Gowns’ and two ‘Angel Capes’. One set can be used to dress the baby and the other set is given to the grieving parents to keep and hold. The gowns are knitted in pale shades or white using a finer more delicate wool. They are knitted to a pattern supplied by the Mothers' Union.